Sales - Support - Supplies - new and used photocopiers, printers, multi-function equipment, plotters, PC’s, Networking, Telephone Systems and Office Furniture including the OKI Executive Series machines, delivered installed and serviced in Crawley Sussex and Surrey. Digital Office Solutions specialise in putting together cost effective ways of enhancing office productivity and at the same time improving quality of output whilst reducing operating costs. Click this image to download our latest "Special Offers"
It became incorporated in 2007, the principles in the business have been in the office equipment industry for 30 years, we pride ourselves on providing reliable products from a host of manufacturers offering value for money and a low cost of ownership. We are Komfort Systems installers for all your office partitioning requirements. Our largest network, data cabling job involved installing 15km of cat6 cable in a factory in East Grinstead. We provide small telephone systems up to 24 extensions using analogue ISDN2, ISDN30 or VOIP lines or any combination. We supply, sell, install and assemble new and used office furniture, desks, chairs, cupboards in Crawley Sussex and Surrey. 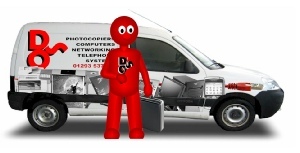 We have been supplying, selling new and refurbished multi-function photocopiers in Crawley Sussex and Surrey for the last 17 years, we can install and setup the copier for network scanning, and printing. We handle all your photocopier on going maintenance and servicing repair requirements on either a time and materials basis or on a cost per copy maintenance agreement..
We supply, sell, repair and maintain all makes of office printers across Crawley Sussex and Surrey. We supply, sell new and refurbished plotters, we also maintain, repair plotters across Crawley Sussex and Surrey. Lastly we can supply all your office stationery including paper, toner cartridges, pens etc at extremely competitive pricing. Some might say “jack of all trades master of none” this is very true we specialise in offering solutions to small business, we are not interested in large multi-nationals, our average client has 1-20 employees at one site. We have clients who have high print volumes requiring machines with a print speed of 50 copies a minute, if you spoke to Ricoh or Canon they would recommend a 50 cpm A3 multi-function device at £4000.00 + vat, we would suggest the Samsung SCX-6555dn that prints at 55 cpm A4 which can cost as little as £1500.00 + vat, this is our forte, finding cost effective ways of achieving your goals.